"All thepersonal was realy plaisant." Hotel Szeleta is in Miskolc-Lillafüred, inside the Bükk Mountains National Park. 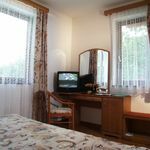 Because it is located the eastern gateway to the Bükk Mountains, nestling in a beautiful valley surrounded by forests and on the banks of the river Szinva. It’s also excellent for business people visiting Miskolc – after a tiring day what could be better for refreshing yourself and recharging your batteries than a few hours spent in beautiful countryside. 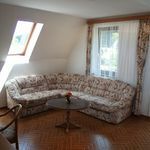 The hotel is extremely well located with many attractions within easy reach: the Lillafüred Forest Railway, the Szeleta Cave, the István Dripstone Cave, Lake Hámor, the Szinva waterfall, the preserved old ironworks, the Trout Farm in Garadna, and the City Zoo, all of which can be reached on foot. Short bus rides or car trips will get you to the famous Thermal Cave Baths in Tapolca, the Diósgyőr Castle, the Bánkút Ski Centre, and other well-known sights. All rooms have colour TV, mini-bar, telephone, suit bathroom with shower and toilet, and FREE Wi-Fi internet access. Included in the price of the room is the buffet breakfast. During your stay you can also use all the following services free of charge, all of which are within the hotel’s grounds: sauna, salt cave and open-air pool, Wi-Fi internet access. In the spacious park beside the hotel you can find table tennis, badminton, swing bowls, and a range of ball games available to guests. We can offer you standing solarium for extra charges. In our neighbourhood you can find three well known restaurants. The rating of Hotel Szeleta Miskolc Alsóhámor is 9 from the maximum 10, 567 based on actual and valid guest ratings and reviews.